What is a field watch? 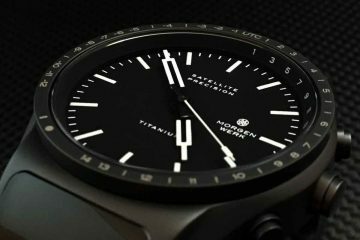 What kind of watch would someone want when in the “field”, or hiking, camping, or other outdoor activities? Solid construction. Easily readable. Fewer breakable components. Night-time illumination. Light weight. This is what we have with the Bertucci Vintage 44 Illuminated. Solid titanium construction, including the solid lug bars, large numerals on the dial for easy readability, tritium tubes for night or low light viewing, sapphire crystal, and a dependable quartz movement with a 5 year battery. 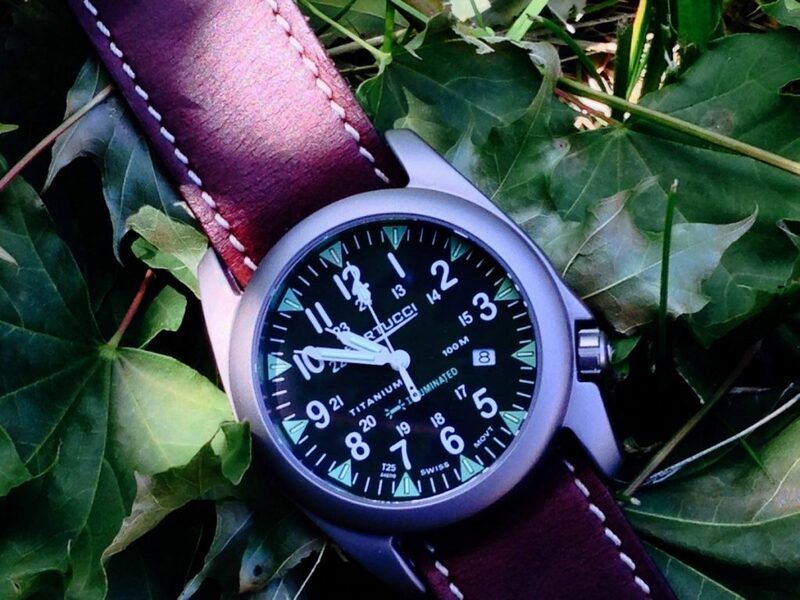 Bertucci envisions making the ultimate field watch, and they want to do it with pride. This is why the watches are designed in the USA, straps made in the USA, the packaging made in the USA, by a USA owned company. 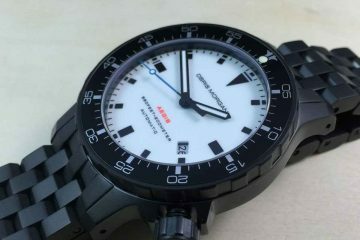 Yes, the movement is Swiss and the cases are produced in Asia, which you would expect at this price point of $439.00. 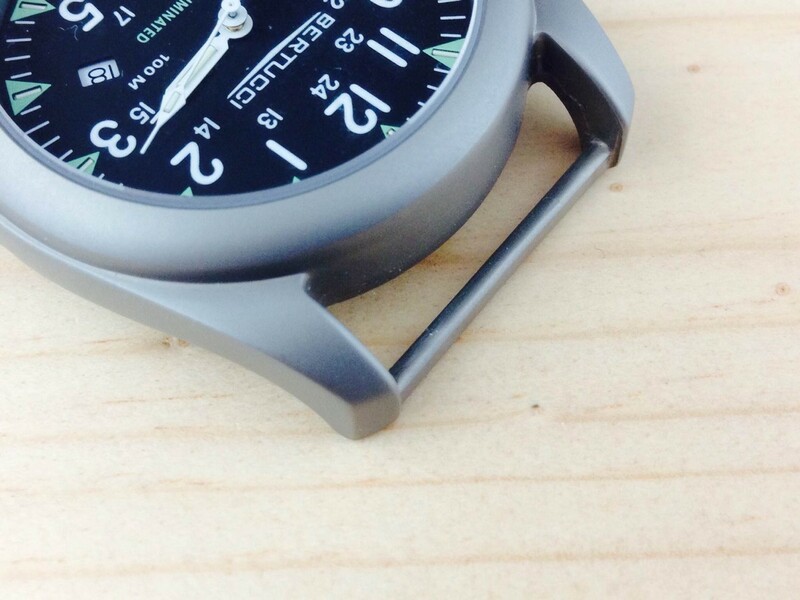 The most intriguing part of the watch when it arrived, was the solid lug construction. I am sure Bertucci is not the only company doing it, but it’s one of a few, and something I had not seen in person before. This reduces the chance of your lug pin or screws breaking and the watch falling of your wrist, to an unfortunate demise. We have all been there at one time or another. Your watch falls off your wrist, the slow motion phase starts, and you shudder for what seems like minutes, even though it’s only seconds, and ponder what is going to happen when your watch hits the ground. 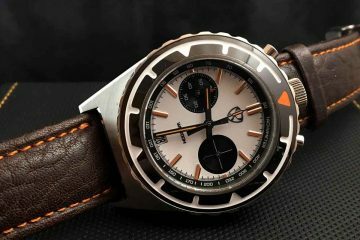 With the Bertucci Vintage 44 Illuminated, being a watch that is made primarily for use in the field, or rugged activities, such as mountain biking or hiking, this is something you would not want to happen, this is definetly something you would not want to happen. Bertucci has tried to eliminate that with this feature. It also makes strap changing very easy, as the one piece straps just slide through the lug bars in seconds. Now, one thing to keep in mind, is the somewhat odd lug width, which is 25mm. So, unless you are going to commission a custom strap smith to make you a strap, you will be stuck with the Bertucci straps. This is not necessarily a bad thing, as the water resistant leather strap seen here is a very high quality strap, with a great roller buckle, and is tough and rugged, and will last a very long time. Additionally, if you don’t like leather, Bertucci has many other straps to choose from, such as nylon straps or their proprietary Tridura strap , which is a mixture of a polymer and a webbed core, which is extremely resistant to drying, cracking or dry rotting. When looking at the dial, I do find it to be a little busy for my taste. I don’t care for the green triangles surrounding the tritium tube markers. Removing these, would make for a cleaner dial. Or maybe all the writing on the dial, with the brand name, model name, titanium, water resistance, and the 24 hour markers in the center of the dial. Additionally, you have a date located at the 4 position. So, the dial has a lot going on. However, I do primarily like a clean, or uncluttered dial, and I know not everyone feels the same. Because of the large Arabic numerals and white hands, it is still an easy to read dial though, which is a key point to this type of watch.